Last week most Canadians were cheering for our beloved Toronto Blue Jays hoping they would make it to the World Series. Unfortunately it didn’t happen however the series was extremely exciting and it brought many people together. 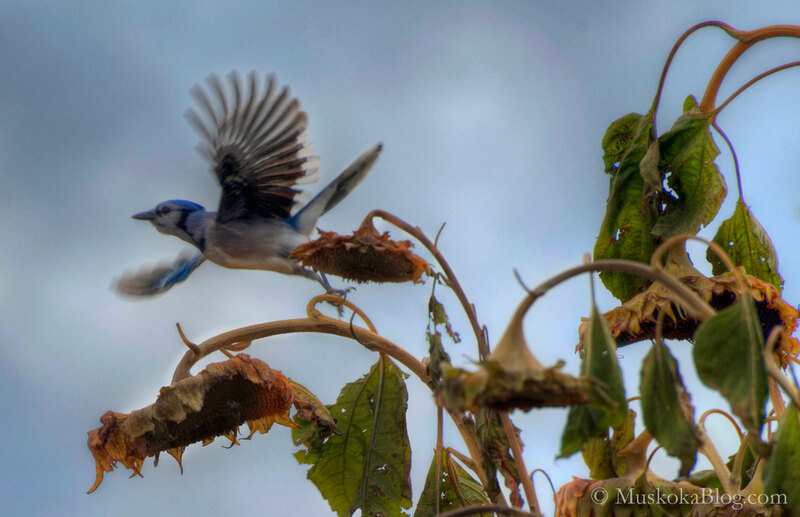 These past few weeks I’ve noticed other unrelenting Blue Jays frequenting the gardens to feast on the seeds from the dying sunflowers. I found it very difficult to get close for a clean shot. They seem so nervous and never stay in one place very long. It was a gloomy afternoon and the sun was dropping quickly with the feel of rain approaching. I teetered back and forth on whether I should go out or not. I ended up in one of my favorite areas to travel to on Lake Joseph where there is hardly any development. I noticed this rock island, shut off my engine and slowly drifted into it. There was a lone seagull who stayed with me while I shot a bunch of photos taking it all in. 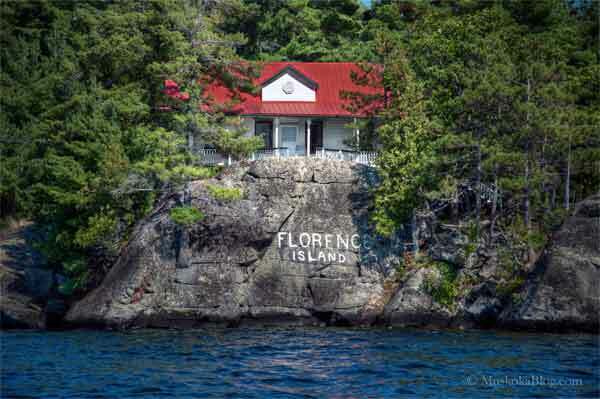 Florence Island is located on Lake Rosseau closer to the Windermere side of the lake. My limited research tells me the island was likely named after William Jermyn Conlin (July 26, 1831-November 19, 1891) an actor who took the stage name Billy Florence after visiting Florence Italy. I was unable to find any information connecting him to the Muskoka area. He was also the co-founder of the Shriners. Ferndale is one of the most visited destinations when showing people the architectural eye-candy by boat around Lake Rosseau. 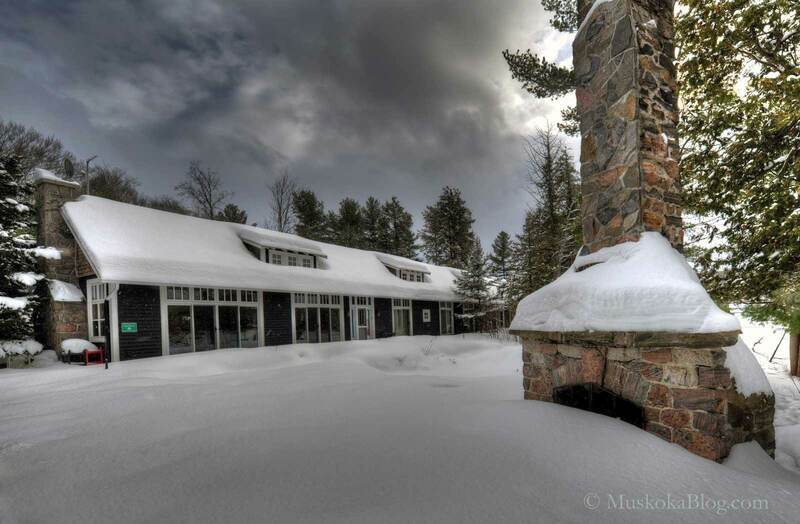 The property is owned by a self made Canadian Billionaire who has amassed great success in the home building business. At one time this magnificent property was called Ferndale House and later it was sold to the Canadian Keswick Conference Centre. The property now supports four boathouses along with a massive cottage mansion, guesthouse, sandy beach, sports courts and a helicopter pad. These two boathouses are relatively new additions. Happy September heatwave! – I took this shot with an Android smartphone. The lens quality in smartphones along with the many amazing photo apps have made it real easy to take decent photographs. It doesn’t take long to create a few thousand photos over time but having a way to archive them for future reference can be a challenge. Say hello to our little friend. Dragonflies are fascinating insects. They are territorial (especially the males) and will defend against their own species and other insects. They can eat about a fifth of their body weight in prey per day, usually mosquitoes. Thank you Savannah for allowing me to share your beautiful story. The original published in the Elephant Journal on April 7, 2015. Six years ago on March 14th, 2015, my mother and sister traveled through the ice to their frozen death on Lake Rosseau. Six years ago you may have read about this tragedy on the front page of The Globe and Mail. Six years ago I was in Myrtle Beach on my friend’s family vacation thousands of kilometers away from home. Six years ago at home it was a perfect blue bird winter day—the frozen snow-packed lake calling all ice fishers, snowmobilers and March Break families out to play. For six years I have been frozen with my mom and my sister at the bottom of the Lake, unable to let them go and unable to take them with me. For six years I’ve been sitting at the bottom of the lake submerged by the weight of the water and all its sadness. Today marks the end of the six-year-long deep freeze: the thaw has begun. I will begin my swim to the horizon where the water meets the air and I will take a deep breath. When I try and picture that day out on the ice I can feel the natural beauty resonating in the refracting snowy lake light. There is purity in that frozen air that shimmers in such a magical way that you can literally feel your soul swell in your body. If you’ve experienced this, you know there’s a universal truth in this feeling. When you’ve experienced still beauty like this it becomes engraved in your memory and when you access it, it fills you with blissful clarity. My mother once said that the best gifts in life are free. She was right; the best gifts in this life are from Mother Nature—they’re honest and unconditional. There is truth in both light and dark places. The truth in the light place that I just described is in the crisp, still air and the glistening snow crust and the peace that exists where they meet at the horizon. The truth in the dark place is under 18 inches of ice and several feet of cold black water. In this truth their bodies were perfectly preserved while Mother Nature absorbed their souls into the Earth’s crust. This is also an honest and unconditional act of Mother Nature; She took them and She’s not giving them back. It has taken me until now to be able to hold this dark truth; they were taken and I was not. They are dead and I am alive. They are not supposed to be here and I am. I was left here for a reason. We cannot do it alone, and yet, we are all we have. How can we both be alone and together simultaneously in a truthful way? I am just beginning to understand the depths of this question. And I know that the fact that there is truth in both light and dark places is a critical part of this balancing act. We must grow comfortable in our own skin to express ourselves and experience beauty authentically. Often that beauty is reflected in sharing experiences with others, but for it to be real, for it to resonate, we must feel the light in our own bodies alone in the dark. We must know our contribution and our worth in just being. Each person’s presence is undoubtedly part of the molecular makeup of this life—we are all connected in one way or another. We are all organic organisms of this earth and therefore, all part of the honest and unconditional gifts of Mother Nature. So it is hard for me to admit, but the truth is this: my mother and sister’s death was a gift. Losing them has given me the gift of courage, the gift of independence, the gift of empathy, the gift of true peripheral vision and the greatest gift of all—the gift of self love. I cry for them often and their tragic death has left scar tissue in my heart, but I hold these gifts in my heart too, and I am only 23. Many people would say that what I’ve experienced is too much for a young woman. I have felt this “ too much” for six years. But, as Mother Nature’s gifts to me have become visible and tangible I am aware of a kind of spiritual wealth that I never would have imagined. This spiritual wealth translates into person power—big energy. In this energy my frequency pulls me out of that water and I get to swim in my soul at that peaceful horizon where the water meets the air. It is time to celebrate. I am not frozen any more. I had to pull myself out of school to begin this thaw and I don’t think I will finish any degree in the immediate future. I will continue to grow in different, maybe unconventional, learning environments. I will continue to study yoga and deepen my own delicious practice. I will travel and sit with Mother Nature in other parts of the world. And, when I get out of the water completely, I will climb to my favourite horizon where the crisp, still air caresses the glistening snow crust on the peak of a mountain. When I close my eyes this is where I want to be—on the peak of a mountain with my feet grounded in Mother Nature and Heaven all around me. loathing. Savannah is done surviving. She ismoving towards thriving. Today Savannah Robinson is a 23-year-old, vibrant young woman. She’s on a mission to find happiness and abundance in everything she does. She loves to do a lot—cook, travel, eat, play guitar, sing, talk politics, art and social justice, back country, deep-powder skiing, yoga, serving tables, bartending—you name it! Of all the things she loves to do though, writing is at the top of the list. Writing is Savannah’s vehicle to share her story with you—the story of her journey out of survival mode. This is probably the last snowy photo I will put up for this season since spring is on everyone’s mind now. I took this photo a few weeks ago while touring around Bala. There has been a lady living in this van (down by the river) who is in protest of the Bala Falls being turned into a generating station. This controversy has been going on for a few years and was originally led by ex Mayor Alice Murphy who lives downstream to the falls. I see the pros and cons for both sides and personally feel that the citizens and taxpayers in Bala are the ones that should be making the decision to determine the outcome. You have to admire someone so entrenched in what they believe that they sacrifice their lifestyle and make a stand. 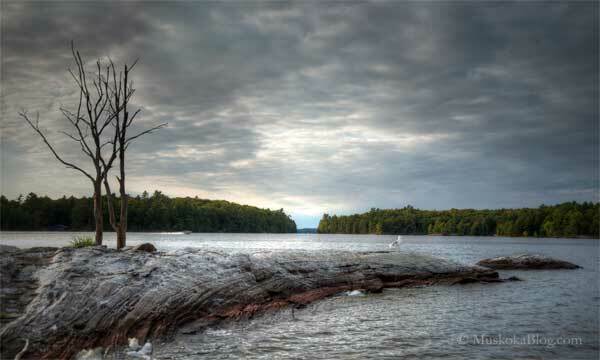 I finally made it up to Muskoka and was able to spend some time taking a few photos. I visited Foots Bay where there is good access to Lake Joe and noticed this mail box on the side of the road. Roadside distractions. Perhaps a honey farm near by or Buzz lives here? I have not made it up north as often this winter. For the lack of photographic content I couldn’t resist posting this. Cheers!- especially to my American friends. You don’t need a big expensive camera to get some decent photos. Experimenting with an iPad camera in the warm fall weather.